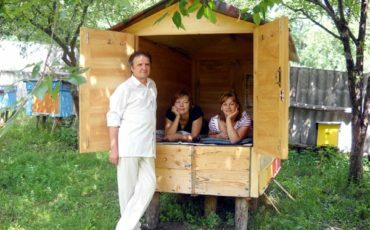 In ten years of such an unusual vacation family of Sumy (city in north-eastern Ukraine) artist and beekeeper cured of all diseases! That’s incredible but in ten years artist from Sumy Nikolai Yarovoy, his wife and two sons sleeping on… the hive with bees! Chronic diseases disappeared and efficiency increased during this time. Unusual hobby began as if by accident. Nikolai’s wife Anna had a bad fall, hit a rock after which she got the backache. Doctors determined that she had spondylolisthesis, and advised the woman to undergo inpatient treatment twice a year. The pain stopped after treatment, but after a few weeks resumed again. And it got to the point that the woman did all the housework on knees, even in the garden. — Once I crawled to the hive with bees, — says Anna. — I straightened, but I was too weak to stand. I leaned back against the hive. And then I feel: the pain goes away. Like after the injection! Till evening I had not thought about problems with the spine. I told my husband about my discovery. After that, we got an idea: what if we try to lie on the hives? Nikolai joined the two hives, made of six planks flooring and spent the night on it. The feeling was bright, unusual. First, it took him only five hours to sleep. My husband got a very high capacity for work, and I also decided to try. First, of course, I was upset. I thought: how would react to these neighborhood bees? But they were hospitable. First, they came to see who’s settled on top. But then they calmed down. We sleep so for ten years, from March until the end of September, and we were not bitten by bee! I forgot about my backache last summer. As, however, about chronic inflammation of the appendages. Today in the garden of Yarovoy family are already four beds on the hives, two of them are double. Hives are under and above the beds. — It is not cold in this bed in any weather, — says Nikolay Yarovoy. Bees maintain a temperature of 36 degrees all year round. People have the same body temperature, so the body will not overheat or become too cold. I confess I could not resist and decided to try all the delights of sleeping with bees. I lie on the hive and felt microvibration. It was a feeling that buzzing wires and something slightly pushes in the back. Then I got dizzy from the smell of lime, buckwheat, propolis and I fell asleep. I slept for ten minutes, but it felt like after a full night’s rest! All accumulated over a week fatigue was gone. Problems receded into the background. — It is also the influence of the apiary, — said the owner when I told him about their experiences. — Because there is a good energy, natural background that restores your biofield. When a man falls on the hive, blood circulation is improved through microwaves, vibration, which comes from bees. The mattress on boards will have no effect, but the sheet will be just fine. Recently, my neighbor made such a bed but put the mattress on boards. And he felt nothing. Sleep on the hives is especially useful for people after 30, because at this age the body’s cells are not so well restored naturally. And after a night with the bees you get up and feel themselves full of strength and energy!